Major gridlines enhance the display of values, while minor gridlines supplement major gridlines. If a plot point falls in between major gridlines, you can use minor gridlines for more precise interpretation of the data. Vertical gridlines in a vertical chart run on the X axis. Horizontal gridlines in a vertical chart run on the Y axis. Horizontal major gridlines enhance the display of values, compared to the Y-axis scale alone. They are enabled by default on many charts. They do not apply to the pie, 3D, gauge, spectral map, or funnel chart type. Horizontal minor gridlines are disabled by default. They do not apply to the pie, 3D, gauge, spectral map, or funnel chart type. Vertical major gridlines enhance the display of values, compared to the X-axis scale alone. They are enabled by default. They do not apply to the pie, 3D, gauge, spectral map, or funnel chart type. Vertical minor gridlines are disabled by default. They apply only to scatter and bubble chart types, where the X axis is numeric. They do not apply to the pie, 3D, gauge, spectral map, or funnel chart type. Note: The orientation of a chart determines the available gridline options. 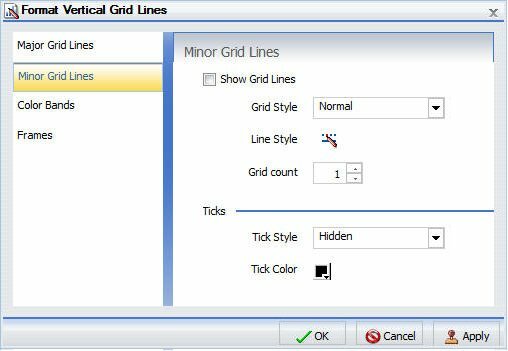 Whether you access gridline options from the ribbon, or the right-click menu, you are presented with the Format Grid Lines dialog box of options to format horizontal and vertical gridlines, color bands, and frames on a chart. Color bands come in a pair, with each band uniquely colored. They appear in a continually repeating pattern behind a series on a chart. The contrast of colors is designed to make the chart easier to read. Alternate formatting can be used to apply different colors to sections, called regions, of an axis. Note: The Color Bands and the Frames options are not available in InfoAssist Basic. Use the Major Grid Lines tab to format the major gridlines on the chart. The Major Grid Lines tab is shown in the following image. Show Grid Lines. Select this option to display major gridlines on a chart if minor gridlines are the default for the chart. Grid Style. Select from this drop-down menu to edit the style of the gridlines, such as adding a tick on the inside or the outside of the line. Line Style. Click this icon to open the Line Style dialog box, where you can edit the color, weight, and style of the gridline. Tick Style. Select from this drop-down menu of tick styles (Inside, Outside, Spanning, Hidden). Tick Color. Click this icon to open the Color dialog box, where you can edit the color of the tick. Use the Minor Grid Lines tab to format the minor gridlines on your chart. The Minor Grid Lines tab is shown in the following image. Show Grid Lines. Select this option to display minor gridlines on a chart. By default, this option is enabled. Grid count. Set the number of minor gridlines that will appear between major gridlines. Use the Color Bands tab to format the color bands on your chart. The Color Bands tab is shown in the following image. Band 1. Select this option to add Band 1 to a chart. Color. Click this icon to open the Color dialog box, where you can edit the color of Band 1. Transparency. Move the slider to make Band 1 opaque (0%) or transparent (100%). The default is 0%. %. Enter or select the percentage of the transparency of Band 1. Band 2. Select this option to add Band 2 to a chart. Color. Click this icon to open the Color dialog box, where you can edit the color of Band 2. Transparency. Move the slider to make the Band 2 opaque (0%) or transparent (100%). The default is 0%. %. Enter or select the percentage of the transparency of Band 2. Use the Quadrant Lines tab to control the placement and style of the quadrant lines in your scatter and bubble chart. The Quadrant Lines tab is shown in the following image. Show Quadrant Line. Select this option to show the quadrant line. Clear this option to suppress the quadrant line. Value. Enter a value to control where the quadrant line will be placed on the X axis. Line Style. Click this icon to open the Line Style dialog box, where you can edit the color, weight, and style of the quadrant line. Use the Frames tab to enable or disable frame regions, and to set the location and style of the frame text. The Frames tab is shown in the following image. Show Frame Regions. Select this option to show a frame region. Clear this option to suppress a frame region. Region. Select from this drop-down list, the region that you want to format. Add. Click this button to add a region. Remove. Click this button to remove a region. Location. Enter the location of the region. Color. Click this icon to open the Color dialog box, where you can edit the color of the frame. Border Color. Click this icon to open the Color dialog box, where you can edit the color of the frame border. Text. Enter the text that you want to appear on the frame. Style Text. Click this icon to style the frame text. For instructions on how to open this dialog box, see the procedures in Using Gridline Properties. When you right-click a gridline on a chart, a menu of options opens. The options for the gridline elements are described in the following table. Removes the gridline from the chart and updates the Live Preview accordingly. Enables you to specify the color of the gridline, using the Color dialog box. For more information, see Color Dialog Box. Opens the Format Gridlines dialog box. For more information, see Format Grid Lines Dialog Box. The following sections contain procedures for customizing gridlines. The procedures are organized by the tab and group in which their associated options appear on the ribbon. The Features group for charts contains commands to select custom chart features, including chart rotation and annotation options. If your chart does not display gridlines by default, use this procedure to generate gridlines. On the Format tab, in the Features group, open the Grid drop-down menu, point to Horizontal Gridlines, and then click Major Gridlines. Horizontal major gridlines are added to the chart. The following image shows a chart with the horizontal major gridlines highlighted and the right-click menu open. Ribbon: On the Format tab, in the Features group, open the Grid drop-down menu. On the Grid drop-down menu, point to Horizontal Gridlines, and then select Minor Gridlines. Right-Click Menu: Right-click the gridlines on the chart, and select More Grid Lines Options. The Format Horizontal Grid Lines dialog box opens. On the Minor Grid Lines tab, select Show Grid Lines. Horizontal minor gridlines are added to the chart. The following image shows a chart with the horizontal minor gridlines highlighted. Ribbon: On the Format tab, in the Features group, open the Grid drop-down menu. On the Grid drop-down menu, point to Vertical Gridlines, and then select Major Gridlines. Right-Click Menu: Right-click the gridlines on the chart, and select More Grid Lines Options. The Format Vertical Grid Lines dialog box opens. On the Major Grid Lines tab, select Show Major Grid Lines. Vertical major gridlines are added to the chart. The following image shows a chart with the vertical major gridlines highlighted and the right-click menu open. Ribbon: On the Format tab, in the Features group, open the Grid drop-down menu. On the Grid drop-down menu, point to Vertical Gridlines, and then select Minor Gridlines. Right-Click Menu: Right-click the gridlines on the chart, and select More Grid Lines Options. The Format Vertical Grid Lines dialog box opens. On the Minor Grid Lines tab, select Show Minor Grid Lines. Vertical minor gridlines are added to the chart. The following image shows a chart with vertical minor gridlines highlighted. Ribbon: On the Format tab, in the Features group, open the Grid drop-down menu, point to the gridline type that you want to format, and select More Grid Lines Options. Right-Click Menu: Right-click a gridline, and select More Grid Lines Options. The Format Grid Lines dialog box opens. Click the Line Style icon. The Line Style dialog box opens. Set the color, weight, and style of the gridline. Click OK to close the Line Style dialog box. Click OK again to close the Format Grid Lines dialog box. The gridline is formatted accordingly. The following image shows a chart with the default styling for gridlines. The following image shows the same chart with the gridlines styled as red, dashed lines, of medium weight. Ticks are short lines which are perpendicular to a gridline. They are used to tick off specific increments along the gridline. Create a chart with gridlines. Click the Color icon to open the Color dialog box, where you can set the color of the tick marks. Click OK to close the Color dialog box. The tick marks are formatted accordingly. The following image shows a chart with tick marks spanning the frame of the chart. Ribbon: On the Format tab, in the Features group, open the Grid drop-down menu, point to gridlines that you want to format, and select More Grid Lines Options. On the Color Bands tab, click the Color icon to open the Color dialog box, where you can set the color of the color bands. Use the transparency slider, or the percentage box, to type or select the percentage of the transparency that you want to apply to the color. The following image shows a chart with Color Band 1 set to a green color with 80 percent transparency. Ribbon: On the Format tab, in the Features group, open the Grid drop-down menu. 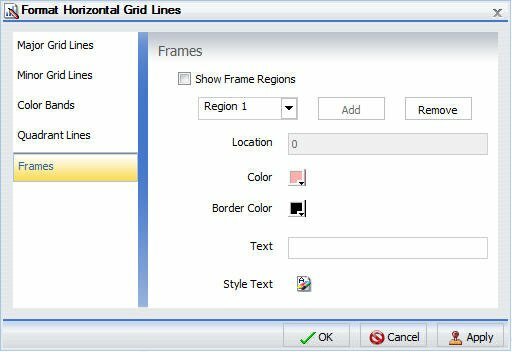 From the menu, point to the gridline that you want to format, and select More Grid Lines to open the Format Grid Lines dialog box. On the tab for the gridline that you want to delete, clear the Show Grid Lines option, and click OK.
Right-Click Menu: Right-click the gridline, and from the menu, select Delete. The gridline is deleted from the chart. Use the options on the Quadrant Lines tab to control the placement and style of the quadrant lines in your scatter and bubble chart. Note: Quadrant lines are on by default for bubble charts and off by default for scatter charts. The following image show a scatter chart without quadrant lines. On the Format tab, in the Features group, click Grid. On the drop-down menu, point to either Horizontal Gridlines or Vertical Gridlines, and then click More Grid Lines Options. On the Quadrant Lines tab, select Show Quadrant Line. The quadrant line displays on the chart. Click OK to close the Format Grid Lines dialog box. The following image shows the same chart with quadrant lines.